A child of the flatlands, I have always loved the wide-open spaces—unrestricted vistas from east to west where it is possible to see the sun appear on the horizon at daybreak, ascend to the zenith, and sink below the edge of the earth in the evening, one day, whole and complete. I have lived in places with trees or buildings or cliffs, where open sightlines are not possible. Such places wear on me and begin to feel confining. But if I can get out, away, on higher ground and see the arc of the earth against the sky—ah, that’s freedom, and my soul soars. Topography must influence our personal histories in some way, certainly in the experiences we encounter, and perhaps also in our very outlooks on life. Can a person who born on the savannah see life the same as someone who grew up beside a great river? Wouldn’t folks living at 8,000 feet have different experiences from those on the coasts? Few places are flatter than central Illinois. The rolling fields, mostly corn or soybeans, go on and on, unbroken until there is a creek or a river. But a “mountain”—the Jumbo—also defined our town, Roanoke, and still does, I suspect. Rising from the prairie at the southeastern corner of town, the Jumbo is the tailings of the Roanoke Coal Mine, sunk in 1881, the second shaft in Woodford County. Although only a couple hundred feet high, the Jumbo stands out for miles around, it’s odd gray and red color contrasting with the rich, black top soil. The Jumbo is Roanoke’s distinctive symbol of place. Against the Jumbo's weathered backbone, the annual Independence Day fireworks show was mounted, as families gathered in the park at its base. 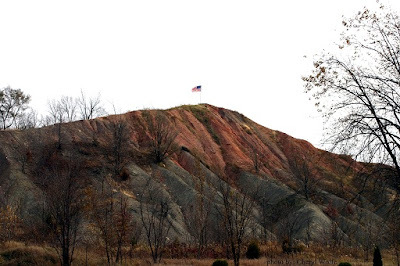 At Christmastime, a lighted star was displayed from the Jumbo's summit, and today there waves an American flag. For us kids in the 1960s, the Jumbo was a place for adventures. We would pack a lunch, a canteen of water, and ride our bikes to the park below the Jumbo and hike to the top. The old railbed, along which rail cars had hauled and dumped the dirt and slag, provided the easiest climb. But some kids liked to try the steeper side. The mound, an uneven pile full of gullies, steep faces, and coarse soil full of sharp gravel, and bits of coal could be slippery. Fall down, and you were likely to sustain a nasty scraped knee or thigh. and the mine had once blown its top off. The longest shaft ran two miles east and a little north of town, on a downward slope. Originally, mules were used to pull the coal cars through the tunnels, and a room was carved out at the bottom of the shaft where the animals were stabled during the mining season, September through April. In 1890, the mine produced 42,000 tons of coal, selling at $2 per ton. At its peak, the mine employed 300 men and hoisted 500 tons a day. For two weeks in late summer, the mine was opened so that farmers could purchase coal to fuel the thrashing machines that traveled through the countryside during harvest time. Two men were killed in separate cave-ins in the mine in 1905, prompting extensive repairs to improve safety and efficiency. Clay brick and tiles were manufactured after the turn of the century adjacent to the mine, utilizing coal-fired kilns. On June 29, 1906, quicksand shot into the mine shaft 70 feet below ground, tearing a scaffolding from the walls, and plunging four men 400 feet to their deaths. The Roanoke Call published a special edition the next day, recounting the tragedy. The four victims—Andrew Mitchell, August Mueser, Camille Faucon, and Joseph Dewasme—all under forty, first-generation immigrants from Scotland, German, Belgium, and France, respectively. Each had married Roanoke women less than ten years before their deaths, and each left young children. On April 14, 1941, several years after the mine and brick factory had closed, the mine tipple collapsed with a roar into the shaft, creating a crater 60 feet deep and wide, and shaking the earth for miles. The Centennial History reports, “The hole filled the next day with the bluest water anyone in Roanoke had ever seen.” The dramatic event marked the end of the mine. The state ordered the crater filled and sealed. The equipment was sold. Only the Jumbo remains of Roanoke’s mining days. Topography holds ambience, history of time and place, and particular experiences for those whose lives it intersects. How has topography affected your personal history? I was just trying to find a picture of the Jumbo to show someone at work this AM and found your blog here. I love the part about the stories kids told - and still did when I was a kid in the 80-90s, graduated in '99. I'm glad the legends of the Jumbo are living still! The Centennial History provided more facts than I had ever known, and the facts were much more amazing than the fiction, in my mind! 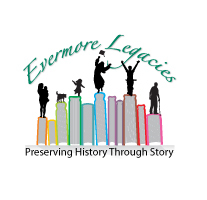 (c) Evermore Legacy Productions. Awesome Inc. theme. Powered by Blogger.